In this category, all the master data related documents will be uploaded. In this videos, you will get the configuration and details of front end transactions of SAP Material Master. You can watch both videos to learn about Material Master. I hope these videos will be helpful for your learning. Visit my document ans videos. Like and Share to reach people. In this video, I have provided the complete configuration and testing of SAP Material Master. I hope it will be helpful for your learning. Unfortunately audio was missed due to technical issues but the content and the data will be helpful. Watch and share with your friends to make it more useful. 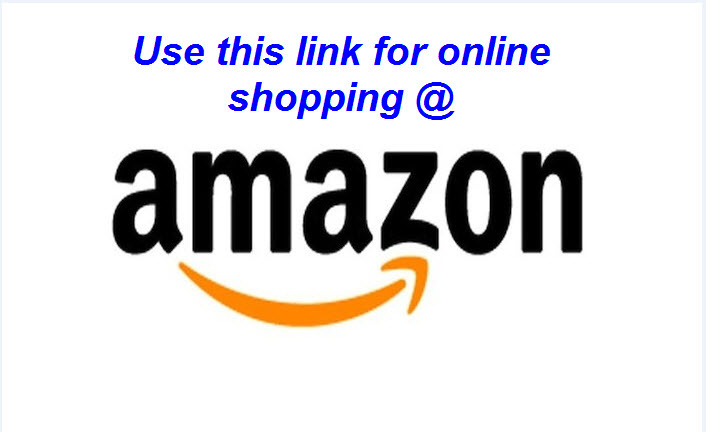 Use Online shopping links in my blog whenever you shop in Flipkart, Amazon etc. I have come with the user manual for creating Service Master. I hope it will be useful for you. The service master record counts as part of the master data within External Services Management and serves as a source of data for you to draw upon when creating service specifications. This enables you to save time and reduces the frequency of errors, since you need only enter the complete service descriptions in the service master record once. Service Master is one of the master data in SAP Material Management. Service Master is used in External Service Management. All Service Purchase orders use service master. Service purchase orders can be created without service master also. Service Master is at client level i.e. once service master is created in system, it will be available for all the plants in that system. We don’t have to extend to individual plants as it is at client level. Service master has to be created for the activities like Maintenance, Painting, manpower work, etc type of service related works. 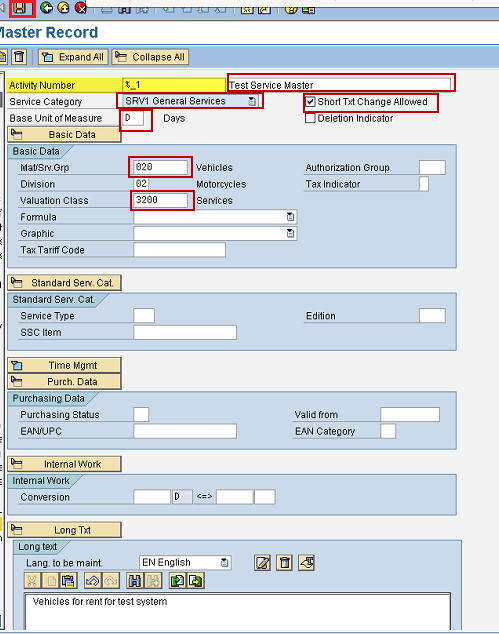 Transaction code AC01/AC03 can be used to create service master in SAP. I have provided step by step user manual to create Service Master in SAP. Activity Number: Activity number means Service Number. It will behave like Material Number. This will be automatically generated if we use internal number range. Unit of Measure: In below screen D- Days is given. Similar to that, Hours, Square Metre etc can be given as Unit of measure. Short Text change allowed: This functionality is provided in Service Master not like Material Master. Because service master is not a single name like material. For example, painting is a service description. During PO creation, it may need to change to Painting wall or Painting of room etc. So, if we flag this option, the short text can be changed during PO creation otherwise it won’t allow making changes. Mat/Serv Group: This is similar to Material Group and it is configured in system along with Material Groups. Valuation Class: This valuation class is completely similar to material valuation class. But in case of material master, different valuation classes can be maintained for different valuation areas as accounting data at valuation area level. In case of service master, single valuation class for a service master irrespective of valuation area as Service master is at client level. Follow the blog for new updates and share with your friends to make it useful to many people. Use Online shopping links in my blog whenever you shop in Flipkart, Amazon etc. I have come with an excellent power point presentation on all the master data in Material Management. In this document, I have provided the overview of each master data in Material Management along with screen shots. I hope this document will be useful to know about master data in Material Management. Material Master is one of the important masters data in SAP Material Management. This document covers the step by step user manual for the activities such as creation, change, extension etc. I hope this document will be really helpful to understand the process of Material Master. Bookmark below link and user for on line shopping which will work for both app and web. Material master is one of the important master data in SAP Material Management. Material is created with transaction code MM01. It contains different views like Basic data, Purchasing, Sales, Accounting etc. In this document, important fields are explained with details. I hope it will be helpful to understand the usage of different fields in Material master views. And also I have provided the levels of material views below i.e. at what level the data will be stored. I have provided the details of important fields in the views of material master in below attached document. I hope it will be useful for you.